Mark's post on the API's blog has further details about the tweaks and integrations. If you whip up something nifty on your Blogger blog using the AJAX Search API, post about it and link to this post, so we can see it in the Backlinks. Thanks! Hoctro's Place has applied the above to Blogger beta - nice work! Hoctro also has a Blogger Beta Playground, so be sure to check out some of his neat hacks. Mark Lucovsky posted a beta blog with the same functionality. Mark posted another AJAX Search API example, the Video Bar.
? I am happy to report that we have added “the rest” to the new version of Blogger in beta. If you have a mobile blog already, we’ll now let you switch over to the beta (if you meet the other criteria, that is). Then just keep sending your pictures and messages to go@blogger.com, and we’ll post them for you. Already using the new Blogger? You can create a new mobile blog simply by sending an e-mail or MMS from your phone to go@alpha.blogger.com. The “alpha” tells us to create the blog on the new version of Blogger. In this same release we’ve fixed some feed related things as well: comment feeds are now showing the latest comments, and pagination works, which solves this known issue. Also, feed URLs on the beta are now also served up from your blog’s domain in addition to from beta.blogger.com. Do you remember the Blogger Mobile jingle? I am happy to report that we have added “the rest” to the new version of Blogger in beta. "The four of us at Boing Boing love music, comics, videos, and books. We especially love them in digital format so we can store them on capacious hard drives, instead of cramming more things into our already overstuffed bookcases. And we super-extra especially love them to be DRM-free so we can read, watch, and listen to them on our MP3 players, on our handheld devices, on our computers, and in our cars." "That's why we created the Boing Boing Digital Emporium, launching today. We'll be selling our favorite DRM-free digital goods and giving the the majority of the proceeds (minus the transaction charges imposed by Paypal and Payloadz) to the creators of those goods." 2. Blogger-powered news from Thailand is available from Bangkok Pundit and 19sep. 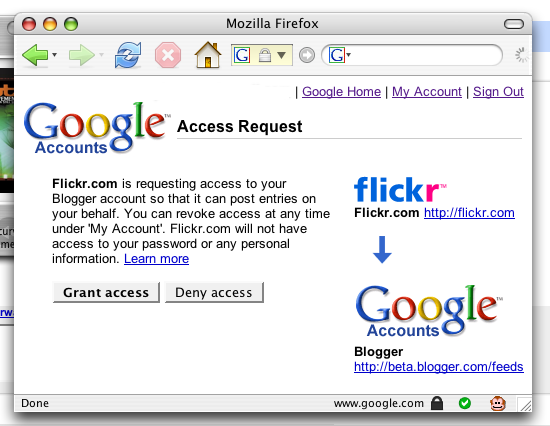 Flickr is using a secure authentication method made possible by the new Blogger’s use of Google Accounts. When you want to add a Blogger beta blog to Flickr, Flickr will redirect you to google.com to enter your username and password. Read more about granting access to websites. Flickr (and other websites that support this technology) will never see your username or password; all of that information is kept securely on Google’s servers. In addition, these websites will only be authorized to post to your Blogger blog. They will not be allowed to access your seach history (if you save it, that is), your Gmail, your Google Checkout data, or any other part of your Google Account. If you ever want to deauthorize a website and disallow it from posting, you can revoke its access from your “My Account” page. Remember, never enter your Google Account login information on a website not owned by Google! , a new blog that will contain fresh information about the status of issues and bugs that affect you. Support form: Users can report problems with the application here to the Blogger support team. Depending on the issue the support team will answer with either some pointers to self-help information, ask for more information, or — in case of a new issue — report it to engineers for resolution. Issues that affect a large group of users will be resolved promptly (meaning that an engineer will start to work on it right away) whereas problems that just apply a single blog or account may take a little longer to fix. Blogger Status: This venue is used by the Blogger Team to report production outages, such as database problems. This is not a place where we report known application issues. Blogger Buzz: This blog contains information about new product features on Blogger as well as posts about cool and interesting things that go on the blogosphere. Blogger Help Group: Here Blogger users help each other with gotchas, tricks, hacks, etc. The Blogger support and engineering teams monitor this forum and occasionaly post on issues of general interest, but it is not the goal of the Help Group to become an alternative to the Support form. I hope this note helps to clarify at which site/blog to seek help in various situations. And many thanks to the good folks on the Blogger Help Group for their feedback, which helps us provide a better service for all users. Some of our users have expressed concerns about the lack of up-to-date information on issues and bugs they’re seeing in the new version of Blogger in beta. What are the engineers aware of? What’s being worked on? And when have bugs been fixed? We’re addressing these questions with today’s launch of Known Issues for Blogger in Beta, a new blog that will contain fresh information about the status of issues and bugs that affect you. 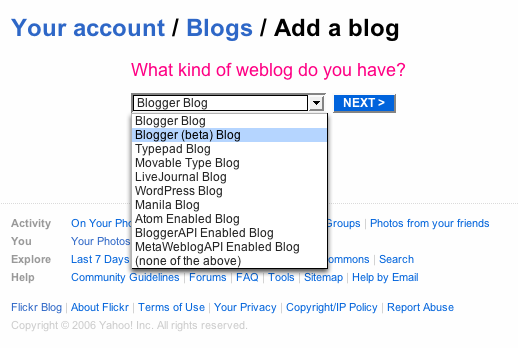 Thanks for helping us continue to improve the Blogger beta! The human mind is exquisitely tailored to make sense of the world. Give it the slightest clue and off it goes, providing explanation, rationalization, understanding. … Well-designed objects are easy to interpret and understand. They contain visible clues to their operation. Poorly designed objects can be difficult or frustrating to use. They provide no clues–or sometimes false clues. They trap the user and thwart the normal process of interpretation and understanding. With that, we say good-bye to the combined Blogger / Google Accounts sign-in box on our homepage. Functional? Quite (though not everyone believes me). Well-designed? Not a chance. We’ve listened to the problems with our combined login box, and we have a solution. The new login choice on the homepage should relieve any Google Accounts–related login trouble you may have. And if you’re like me and still haven’t been able to switch to the beta, you’ll be happy to find that your password manager will stop trying to fill in your Google Account login information on Blogger. Sincere apologies to everyone who was a victim of our bad design and had trouble or even couldn’t log in. We goofed on this one, and we’re sorry.